My parantha preparing skills are directly proportional to the number of years I have been married! Though I always loved to savour stuffed paranthas prepared by my mom, I never bothered to try my hand at them....till i got married. One lesson cooking teaches you is that "practice makes one perfect!" And when the family is typical North Indian foodie, there is virtually no escape from cooking! 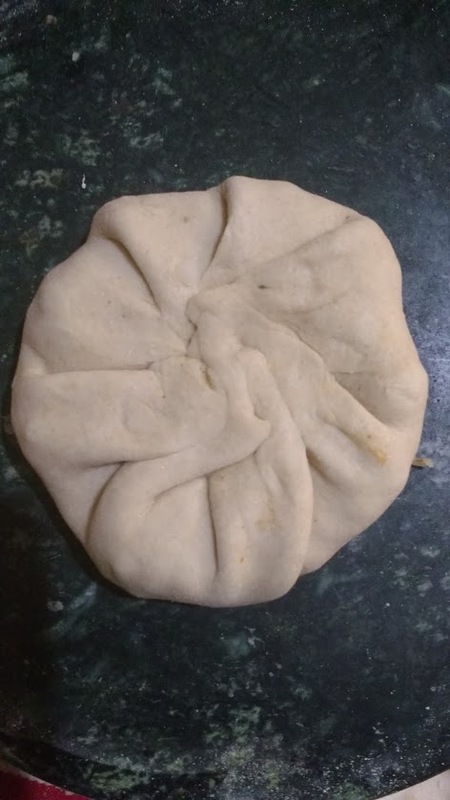 Over the years, it has been an interesting journey - from joining two separate dough discs with stuffing spread between them to effortlessly managing all sort of stuffed paranthas. 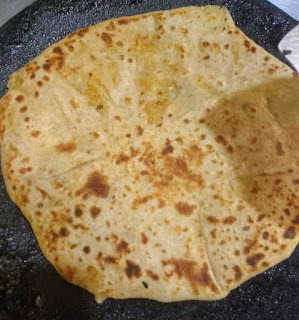 My heart swells with pride when my mom in law says I have become a pro with Paranthas. Finally! All married women will understand what that means coming from the MIL herself! Being a lazy cook, one thing that gives me jitters is elaborate recipes. Often I have skipped recipes by merely glancing at the long list of ingredients. 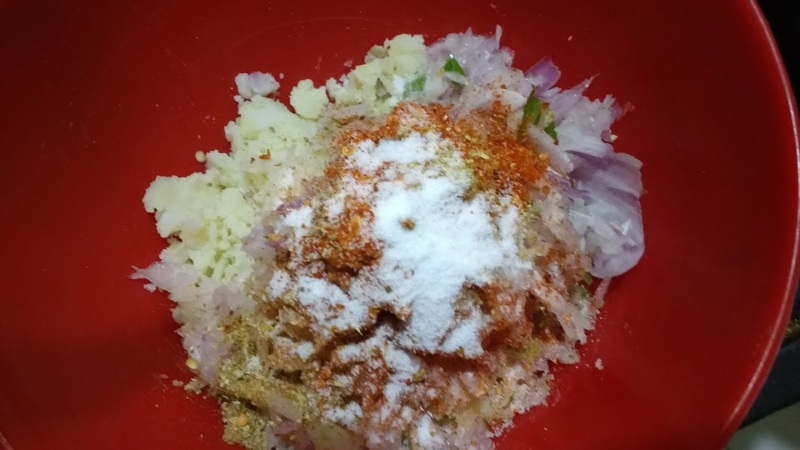 Having spent decent amount of years honing my culinary skills, I can say that a good recipe is not one involving elaborate ingredients but the right quantity of the right ingredients. For just like too many cooks spoil the broth, too many ingredients mask the flavour of the key ingredients! Sunday breakfasts is incomplete without hot paranthas. 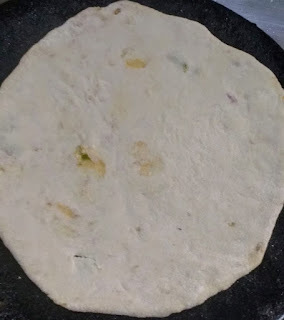 Here's the way I prepare Aloo Paranthas, albeit my simple way, sans any elaborate ingredients. Green coriander - few sprigs, finely chopped. 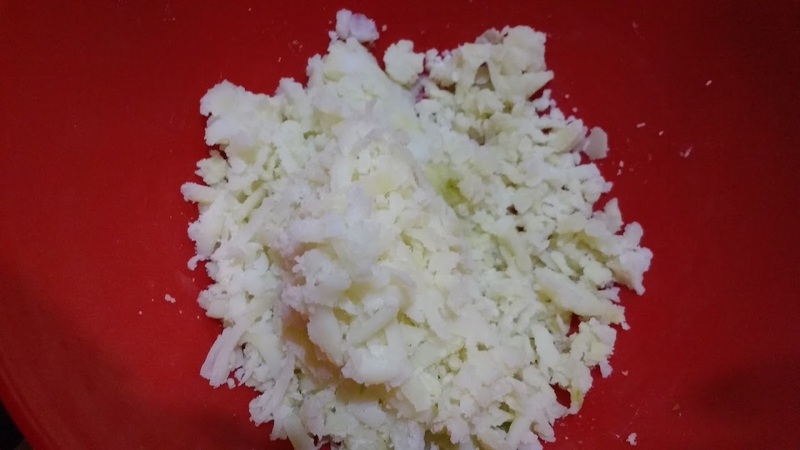 Mash boiled potatoes in a bowl. 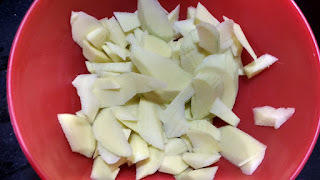 The potatoes should neither be hard boiled nor very soft as it will be a herculean task to manage the paranthas that way. 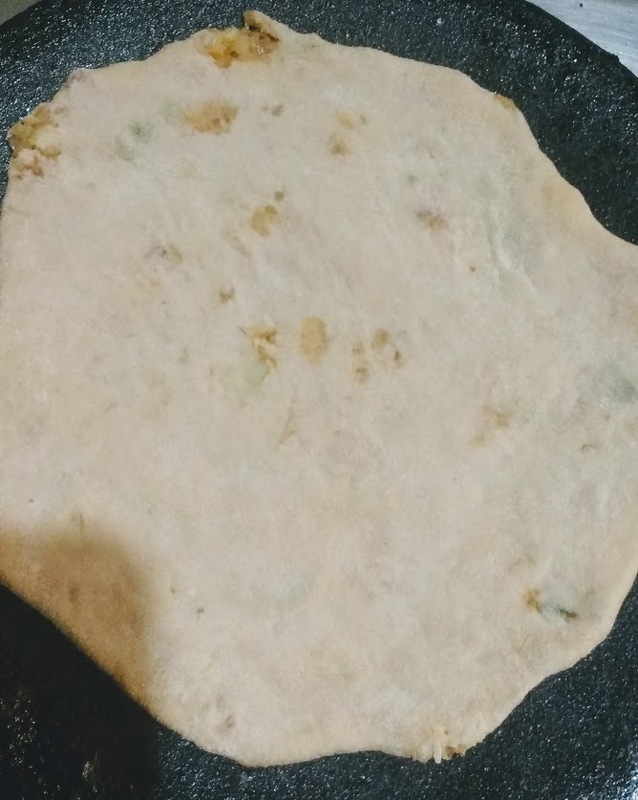 A simple tip I have learnt from my mom in law is that the softness of the dough should be in perfect harmony with the softness of the stuffing to get the perfect paranthas. If the dough is too tight vis a vis the stuffing, the stuffing will escape the paranthas whereas if the dough is too soft, you will have a nightmare rolling the paranthas. 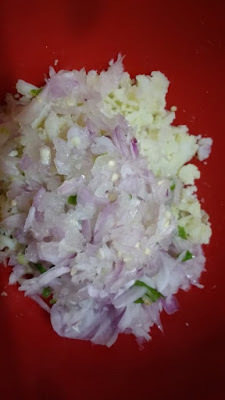 Add chopped onion, chopped green chillies and chopped coriander. Now add the spices - salt, red chilli powder, asafoetida, carom seeds, coriander powder and mix well into a homogeneous stuffing. 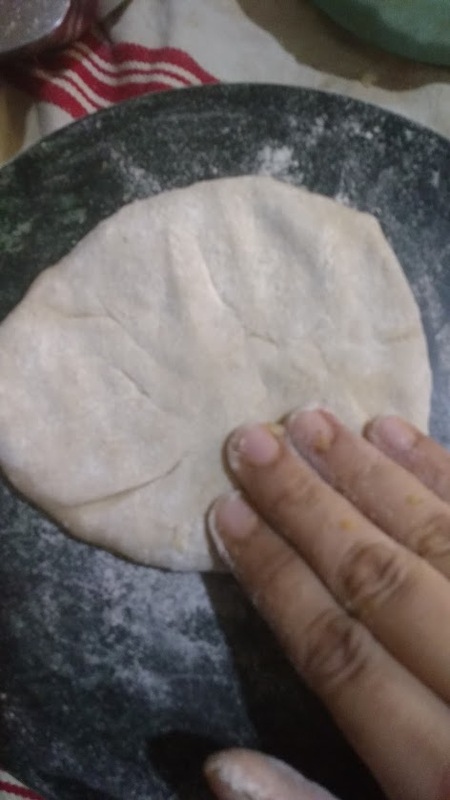 Take a ball of the dough (I take a little larger than the normal ball I take for chapati, since a lot of stuffing has to be accommodated). A little larger than the size of a boondi laddoo, I would say. Roll the dough into a small circle using a rolling pin. 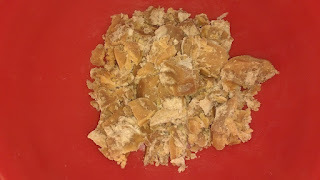 Place the stuffing in the centre and centre and spread a bit taking care to leave enough distance from the sides. Now the quantity of stuffing is subjective. Depends on how much stuffing can you manage without tearing the paranthas while rolling. I say, start safe and increase the quantity as you gain confidence. Fold the sides keeping the stuffing in between. 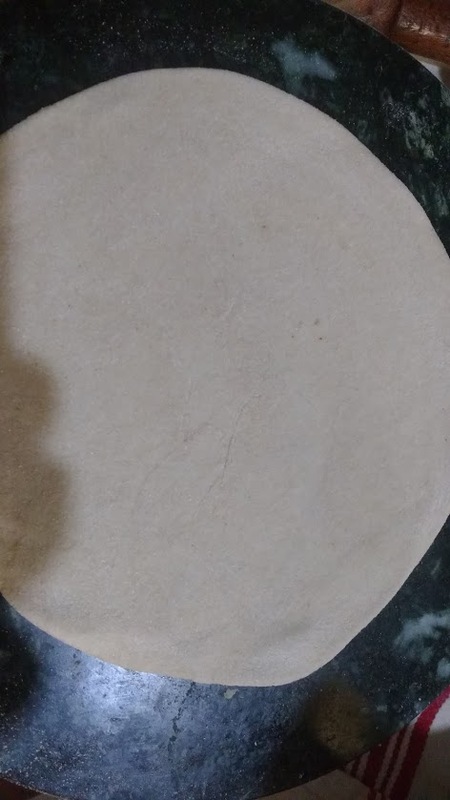 Dust some dough on the disc and with hands, press lightly to expand as much as you can. Now, using a rolling pin, lightly roll the parantha till it reaches the side of a chapati. 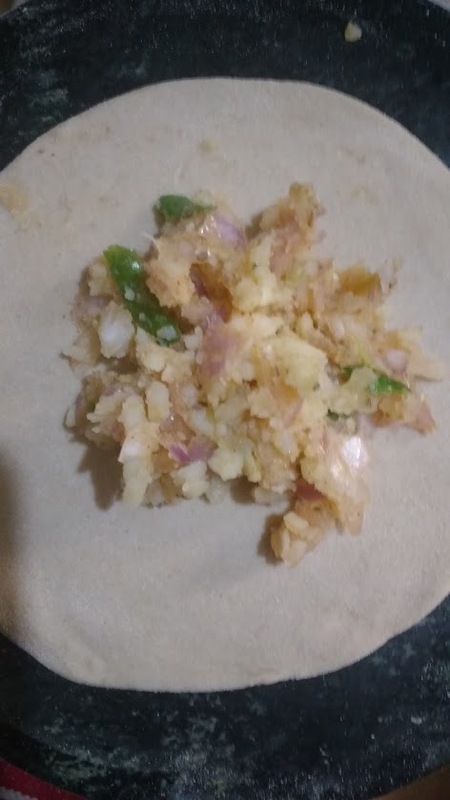 Take care to roll lightly, else the parantha will tear and the stuffing will escape. Heat a tawa/griddle and place the parantha on it. Cook both sides well, smearing oil (Punjabis are very generous with oil however, I prefer low oil paranthas). 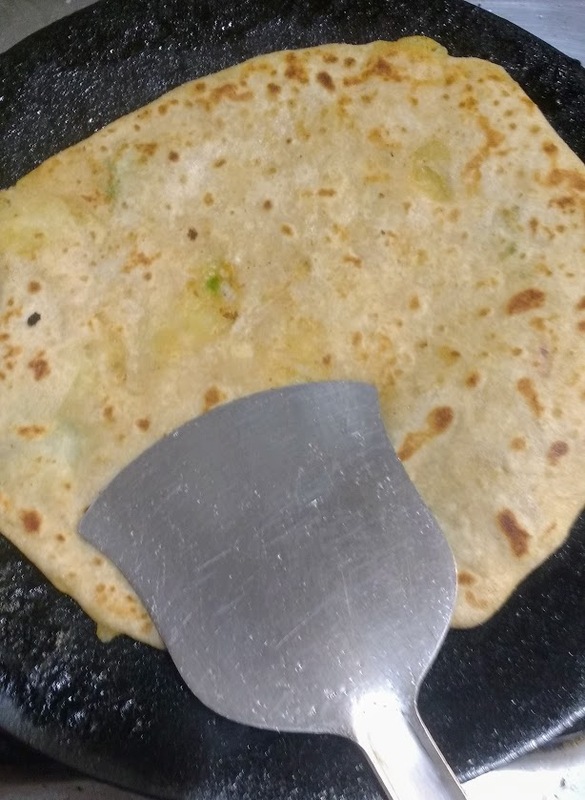 When the parantha gets a nice golden brown colour, take off the flame. 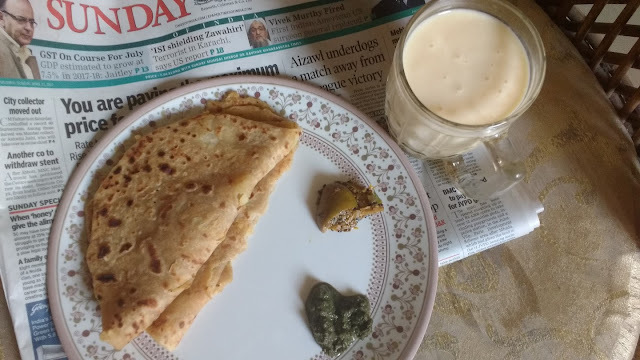 Paranthas are the most favoured North Indian breakfast. Serve with curd/raw mango pickle/Mint -Corriander chutney or just a generous dollop of homemade butter! 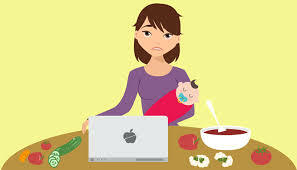 I confess, I am a lazy cook! Like all good Indian wives and mothers, I too love to whip up delicacies for my husband and child. 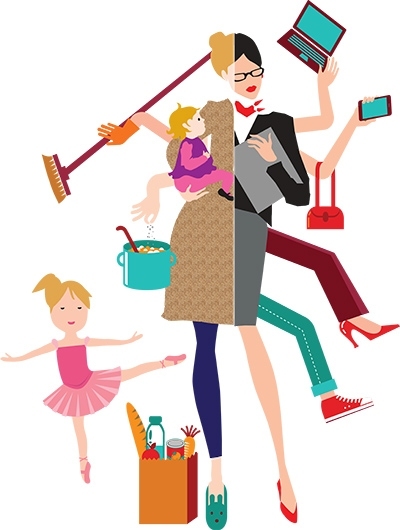 The reality - Juggling between a demanding job, house and a toddler in his terrible two's, my passion for cooking is limited to something simple and quick that helps me save "me time" yet bring a smile of satisfaction on the faces of my loved ones. My fondest memories of summers from my childhood are related to mangoes. Since we weren't a typical small nuclear family (we are 4 siblings! 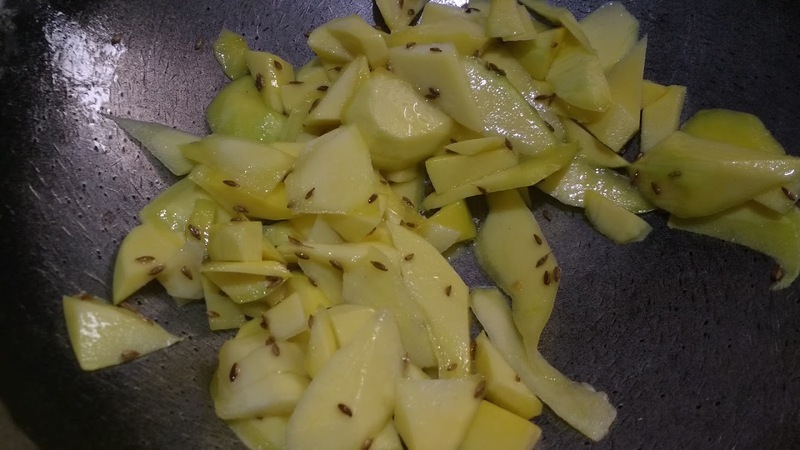 ), mom would make frequent trips to the wholesale fruit and veggie market (called Mandi in Hindi) and come home with Aam ki peti! 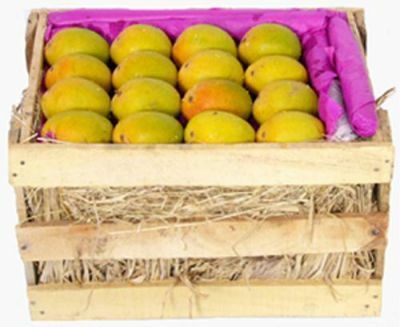 (wooden cartons used in wholesale markets, containing anywhere between 5-10kg mangoes). The mangoes would be welcomed with a lavish dip in bucket of water from where they would be carefully picked by each one of us at our own wish. Mom would also get the most amazing ambi/raw mangoes/kairi. 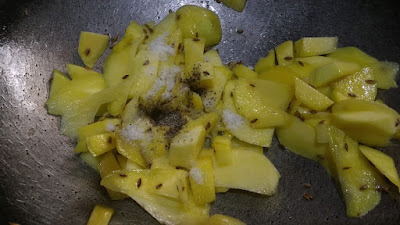 While most would be used for the annual mango pickle ritual, a sizeable lot was saved for the aam panna. 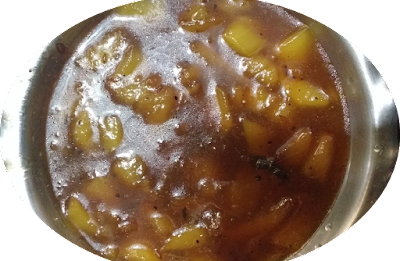 Another delightful side dish mom prepared was the ambi/raw mango launji - a raw mango chutney. Mom would make lot of it at one go and we would eat it with our morning paranthas. 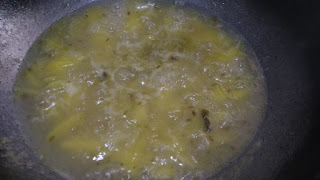 I had been craving for mango launji since the time mangoes announced the arrival of summers. But the very thought of standing in front of the gas for long would make me chicken out! Finally, my mom in law came to my rescue and taught me to prepare instant raw mango launji. 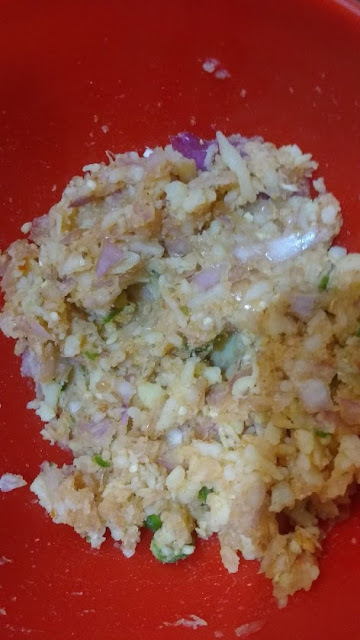 At first, I was apprehensive, but believe me, the moment I took a bite of launji with parantha, it tasted just like the raw mango chutney I once ordered from Kitchens Of India. 1. 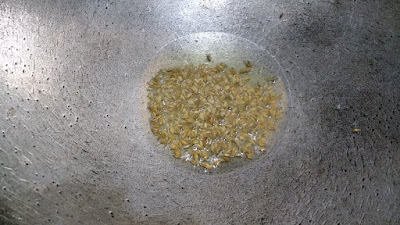 Heat ghee in a kadai, add asafoetida and cumin seeds and allow the cumin seeds to crackle. 2. 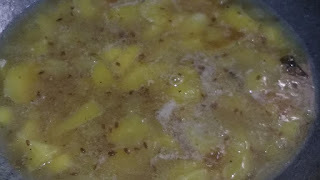 Once the cumin seeds crackle, add the shredded raw mango. 3. Add salt and pepper and mix. Cover and cook for 3-4 minutes. 5. When the raw mango becomes tender, Add the chopped jaggery. Cover and cook on low flame for 5 minutes. 6. Check the consistency. 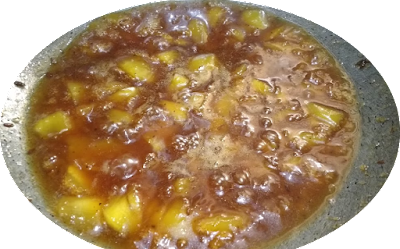 Once the chutney thickens to a chutney like consistency and the jaggery gives it a beautiful brown colour, the chutney is ready! 7. Transfer to a bowl and serve chilled with paranthas. The chutney has a shelf life of 3-4 days when stored in refrigerator. However, it tastes so awesome that you will most likely finish it on the first day itself! While it is the perfect accompaniment for paranthas, it can also add zing to an otherwise boring meal. While we used to have many varieties of mangoes in the North - Safeda (tastes best in mango shake), saroli, chausa, langda, dussehri, totapuri, my favourite ones were the langda and the chausa, simply for their sweetness and abundant pulp! I could have anywhere between 3-4 chausa at a time! However, Mumbai boasts of Alphonsos (though I am yet to learn to identify the authentic ones) and Kesar and our palates are slowly getting conditioned to them. Which is your favourite mango variety? Do you have an interesting mango recipe to share? Do let me know in the comments section. 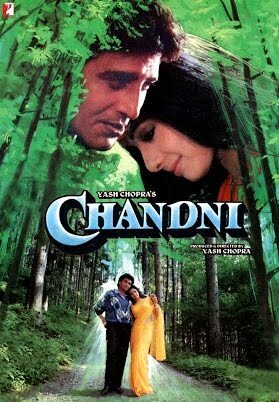 I must have been five when Chandni was released. Though I have faint memory of watching this movie with my family in theatre, all I remembered about the movie was Sridevi's "Safedi ki chamkaar" white clothes and the song, "Mere haathon mein nah nau choodiyan hain"
The song was a rage among girls and I remember, no ladies sangeet function or birthday party would be complete without girls dancing to match Sridevi's steps. So impressed was I with the song that I made mom buy similar combination glass bangles for me! Those were the times when I would go to theatre not for movies, but for Campa Cola! Yes, you heard me right. A bottle of chilled Campa Cola would be my reward for being sensible throughout the movie! While I am sure the movie would have been broadcasted many a times on TV all these years, I never got a chance to watch it. Tried searching on Youtube few years back, but the trailer and paid version was not a motivation enough. So, after 20 something years, I finally chanced upon Chandni being broadcasted by Max2. Not wasting the chance, I announced my veto over remote control as I really wanted to know what was the rage all about! Right from the first scene, the movie presents flavour of typical Yash Chopra movies, as we see a big fat Indian wedding in full swing! The bubbly and vivacious Chandni (Sridevi) makes a heartwarming entry into the viewers' hearts as she arrives for her cousin sister's wedding. Simple girl with a zest for life, this girl next door of the 80s had no frills or air about her. So, when Rohit (Rishi Kapoor) spots Chandni dancing to Mere Hathon Mein Nau Nau Choodiyan, it is love at first site. When Rohit stops Chandni's way and proposes to her, somehow I was reminded of the latest buzz around anti romeo squads! Jokes apart, the romance of 80s was simple and a lot about communication with mere expressions. So, when Chandni agrees to stay back for a few days after the wedding, Rohit understands that his feras (hovering) around his dream girl were finally paying off! But, like all Bollywood movies, there would be no spice if all went smooth. Hence, comes the great economic divide! While Chandni comes from a typical middle class background, Rohit belongs to an affluent family that views his true love with a jaundiced eye. However, Ramesh (Anupam Kher), Rohit's brother-in-law and surprisingly, the selfless and sensible Ghar Jamai, mediates and convinces the family to accept Rohit's choice. Though, as the movie progresses, one realises the acceptance is only namesake, for the family shows no visible signs of affection for Chandni or her family, even post engagement. Life seems like a fairytale with Rohit and Chandni romancing in the Alps (For a moment, I thought the director decided to give the wedding sequence a miss and jumped straight to the honeymoon shot!). Just when you think the remaining story would be about the sweet Chandni struggling to achieve "Hriday Parivartan" (Change of heart) in her in-laws, the smart director leaves your expectations far behind and proves his mettle by dropping another bombshell. In an effort to pamper Chandni by showering her with flowers from a helicopter, Rohit hurts himself and is declared paralysed and bed ridden for the rest of his life. While the middle class values in Chandni transform her from a fiancé to a caregiver, the family grabs this opportunity to insult her by calling her unlucky for their son. Gradually, to Chandni's horror, Rohit's attitude too changes and he rebukes her care in the name of sympathy. Now, one thing about Bollywood movies is that the hero can never be shown in bad light. Hence, immediately after, a sad Rohit is seen confessing to Ramesh that he did all this to save Chandni from spoiling her life with a paralytic. Anyway, a heart broken Chandni is forced to move away from Rohit's life to Mumbai, where she tries to gather her life and move on. She finds shelter in her friend's house and begins her job hunt. As luck would have it, on her way to an interview, she bumps into Lalit (Vinod Khanna) who, incidentally happens to be her prospective boss. While all this may have been sounded as a surprise back then, the tactic was used later by directors to display smartness of ambitious girls. For a moment, life seems to be giving Chandni and Lalit a second chance as a lonely and heartbroken Lalit gets drawn towards Chandni. 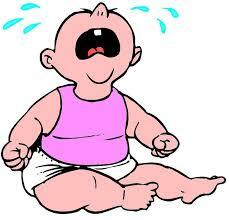 But, then the story can't just move on leaving Rohit behind. So, one fine day, the volcano of Rohit's love erupts and he decides to get on his feet to win back his lady love! As luck would have it, Rohit and Lalit bump into each other in Switzerland (Yes, how can be a Yash Chopra movie be complete without Switzerland!) and get on like brothers lost in Kumbh Mela! Though I am sure if they knew they shared a common love interest, we would witness a duel in the Alps! For Chandni, who had been trying to move on, the typical emotional dilemma of a Bollywood heroine begins, with both her lovers trying to win her love. Though she had half heartedly committed to Lalit's proposal to honour his emotions and his mom (Wahida Rahman)'s love, would she be able to forget her first love? While most of you would definitely know the answer, let me leave this puzzle unanswered for those who are yet to catch up on this popular movie. I ain't sure that in 2017, how much would you be able to resonate with the story. But, would definitely recommend this movie as a one time watch for feel of 80's romance, when handwritten letters, romancing around trees, wearing full clothes and no kissing scenes too could express love beautifully! The song that is still played by radio stations each time it rains - "Lagi Aaj Sawan Ki"
The beautiful Sridevi's mascara eyes and vibrant 80's dressing, especially her white suits and bangles, epitomising the title. Switzerland locations, though my home sick eyes found happiness to see India Gate, Dandi March statue and ridge. Why would someone sing a song like "Main Sasural Nahi Jaungi" (notice the complete lyrics) at her own engagement, that too knowing the hostile nature of her in-laws? Sridevi is shown to share accommodation with her friend when she lands up in Mumbai. However, once she finds job as a secretary in Vinod Khanna's company, we see her graduating from a paying guest accommodation to a swanky duplex bungalow! In one sequence, both Lalit and Rohit are seen trying to reach Chandni on her landline. In the age of letters, when social media and internet were non existent, how come Rohit knew Chandni's Mumbai address and contact number, especially when he had lost touch with her? 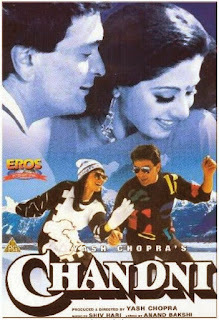 Chandni was the first movie in which Sridevi dubbed her own dialogues. She even sang the popular number "Chandni, O Meri Chandni"